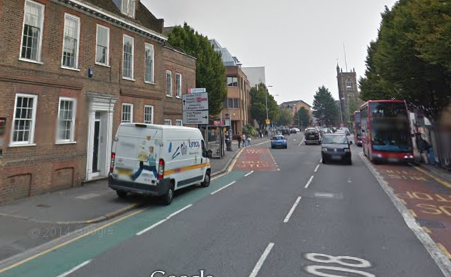 Given the watered down draft for Portsmouth Road in the mini-Holland programme, you might be forgiven for thinking that Kingston Council didn’t know what a segregated cycle lane is. 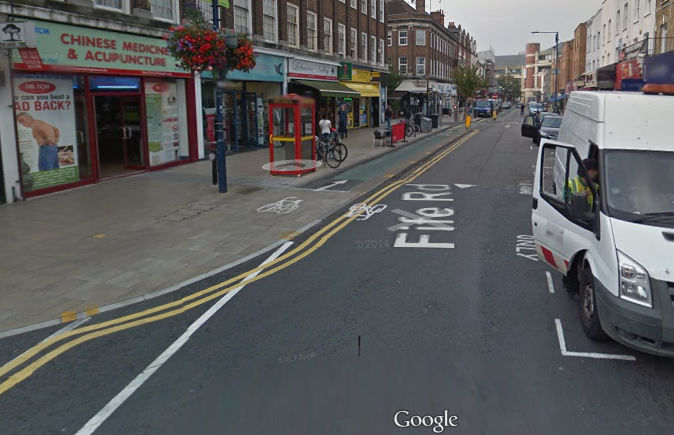 Yet Kingston already has some segregated cycling infrastructure. These are by no means great, as they are typically short and often feature pedestrians walking down them. But they do get you out of the way of traffic for at least five seconds. So, let’s take a look at what exists right now. 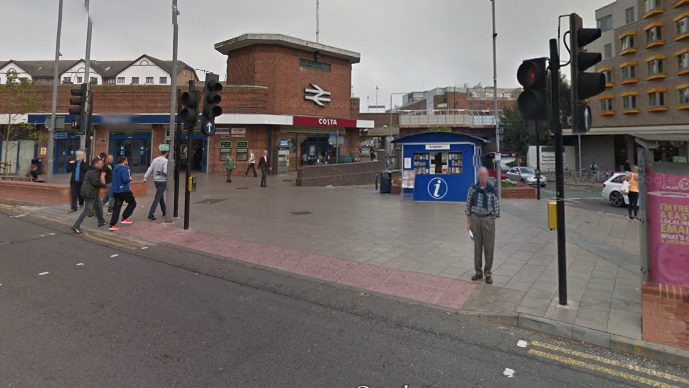 Firstly, in blue, there’s the Richmond Road bypass toward the station. 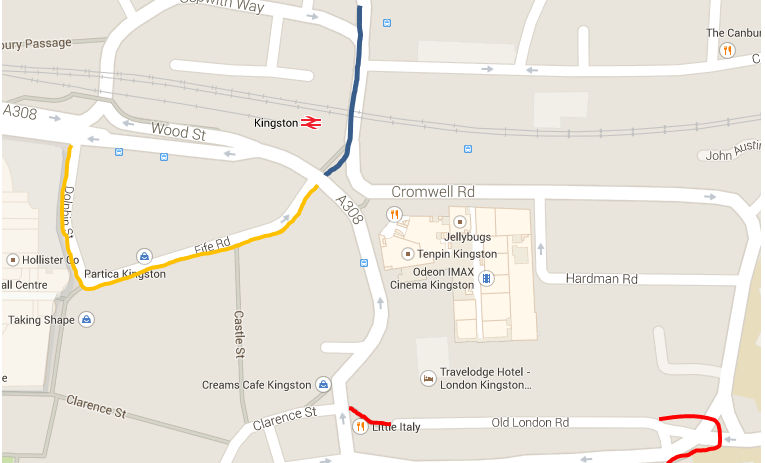 Running parallel to the road leading into Kingston town centre, this allows cyclists to safely pass queuing traffic. The lanes themselves are fine, but crossings are problematic with the usual mix of cycling and pedestrian infrastructure that dumps riders out by the station in a shared space convenient for the police to ticket confused cyclists. 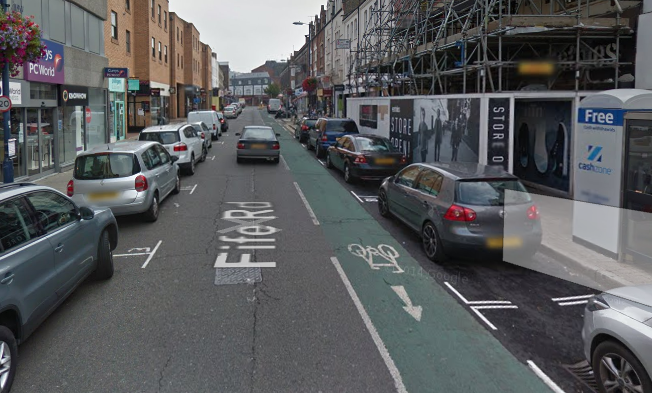 Interestingly, Kingston’s cycling document used a picture of the segregated lane as an area where pedestrians filled the cycle path. The solution was clearly to remove the cycle path and have nobody happy. Crossing Kingston’s urban motorway leads to Fife Road, in orange on the map above. This road is mostly one way for car traffic, but suffers from having street parking next to the town centre and therefore a fair number of traffic movements. The segregation here forms a narrow lane, coming on and off the pavement. Amusingly, this was rebuilt some time ago, having to hastily add ramps so cyclists could move up and down the kerbs from road to pavement level. This is segregation done on a completely half-hearted manner. The segregation moves into a painted lane that comes between oncoming drivers and parking spaces, nicely placing cyclists in the door zone. Of course, when a driver absolutely must move across the cycle path into a parking space, it is the cyclist who is expected to brake. And then, at the end of the road, the cycle path simply disappears. A tiny sign on a bollard indicates a shared path, but this is far from clear. The final route runs past Kingston’s famous red phone boxes, which have a short cycle path running behind it. This drops into a car clogged cul de sac, with frequent conflict with lorries arriving for the various furniture stores and Wilcos. 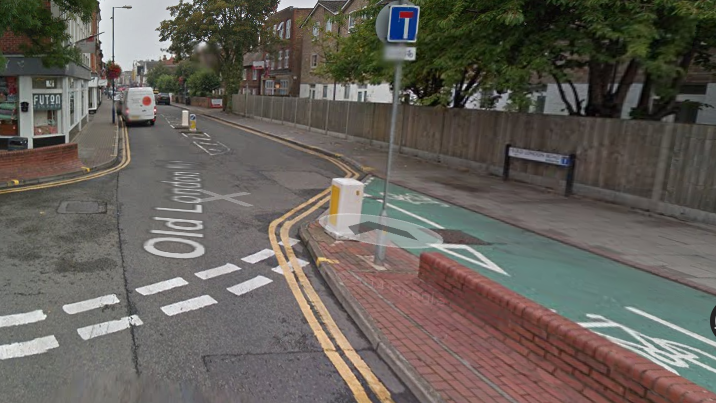 At the other end of the road is a traffic island, with separate pedestrian and bike areas. It’s clear which traffic mode is preferred, as the double crossing makes it very rare for cyclists and walkers not to face at least one stop, unlike road traffic which stops once at most. The short area of cycle path is particularly crap when heading into town. Cycles must give way to road traffic, which requires cyclists to turn their head right round to check for traffic behind them. This sounds reasonable to a car driving road engineer, but it’s crap when attempted with a child on the back of your bike. Essentially, it’s a stop sign. Given that this road is a through road for bikes and a dead end for motorised traffic, this is extremely poor road design. Continuing past the school is more segregation into a quiet road, which makes up a largely unmarked cycle route. However, the segregation has been granted at the expense of pedestrians, making a mess of the pavement. Consequently, pedestrians frequently walk in the cycle path, rendering it pointless. These isolated paths have potential. But they’re not well used right now because at best they only provide safety and convenience for part of a journey. At worst they are pointless and dangerous. Subjectively, it feels that the planner had a good idea, but never actually thought to test their design. Clearly there was once a plan for cycling in Kingston. The goal now must be to finish the job, in a high quality manner that actively encourages cycling by people of all ages and speeds. The armadillo and magic paint proposal for Portsmouth Road will not move towards this goal and must be re-thought. 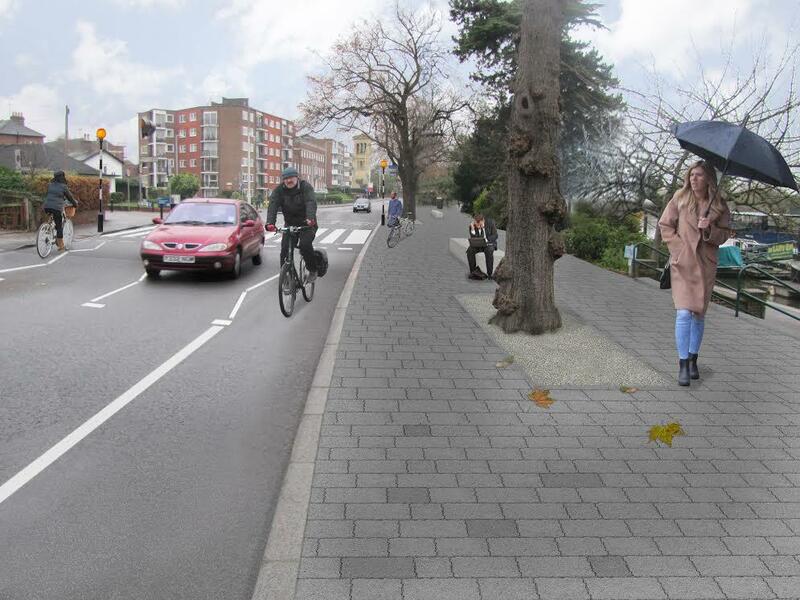 The consultation period for the Portsmouth Road mini-Holland proposals is now open. This proposal has been significantly downgraded from the original proposal which provided a fully segregated cycle path. In my view this revised proposal fails on all counts. 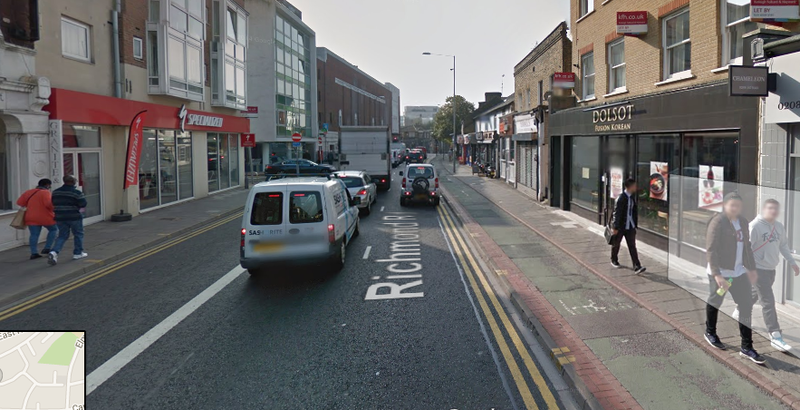 While that part of the proposal nearest Surbiton is segregated and would meet the above criteria, the proposed upgrade rapidly descends to using paint and armadillos to protect cyclists. Paint has long been shown to be useless in protecting cyclists from motor traffic. Armadillos have been used elsewhere, but have been unable to withstand being next to traffic for long. Neither measure will persuade potential cyclists that they are safely separated from heavy motor traffic. My responses to the consultation are below. A couple of points. there is no space to comment on the armadillo separation. Somewhat craftily, the council don’t consult on this part of the scheme. I enclosed my comment on both in Improvement 3. Improvement 2 is not about the cycle improvement, but there’s opportunity to comment on adding Dutch style pedestrian and cycle priority over side roads (link 1, link 2). Improvement 3 states “segregated cycle lane” for a mandatory cycle lane. This is not segregated. Update: Following this post, the question to Improvement 3 has been reworded. All mention of the cycle path is removed. It should still be valid to mention this in your response, highlighting that this will not encourage the take-up of cycling. Revised Proposal. Horrible, unsafe, and grey. The access point is welcome. 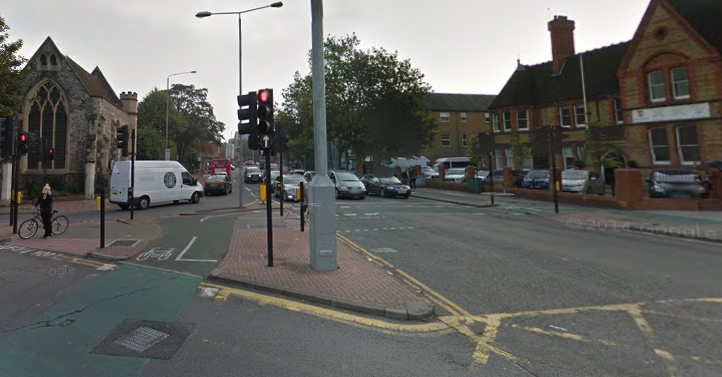 However, both pedestrian and cycle traffic along Portsmouth Road should have access over motor traffic turning into side streets (in this case, Anglesea Road), as per Dutch best practice. This priority for pedestrians is already in the Highway Code but seldom adhered to by motor traffic. The infrastructure should be altered so walkers and riders have explicit priority. There are many existing examples in the Netherlands. 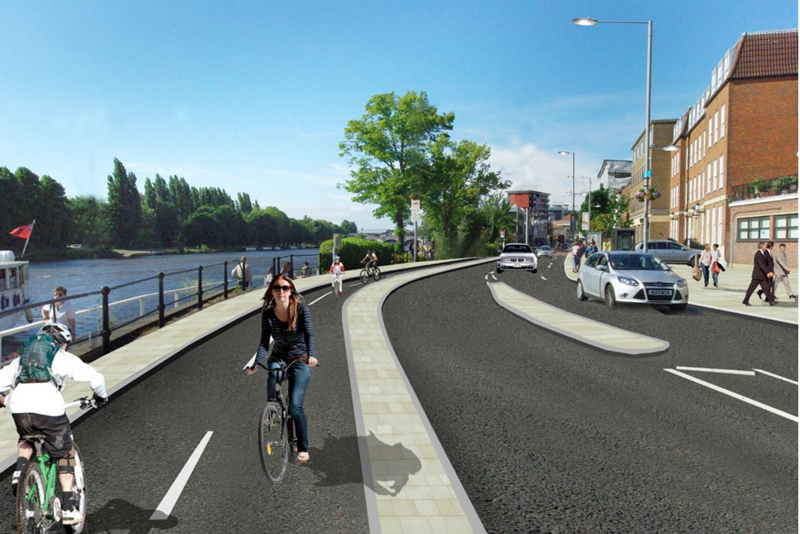 To what extent do you agree with improvement 3 – section of segregated cycle lane, depicted in the artist’s impression image above? Reminder: Your consultation response can be submitted here. So Cllr David Cunningham is quoted in the Surrey Comet as saying that the Mini Holland “is not a scheme to encourage cycling to the detriment of other road users”. There are two parts to my response to him. 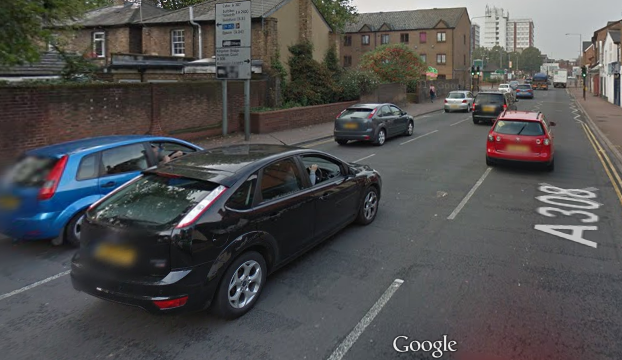 The original Portsmouth Road was not to the detriment of other road users. So it does not need to be watered down. Why remove the segregation when we started with two lanes for motor traffic and still had two with segregated cycle routes? Do drivers need those extra metres on each side of their car? The result of this tinkering is a mandatory cycle lane that will not attract new cyclists, while leaving space for cars to illegally block the cycle lane. I would happily ride down a segregated cycle path with my children. I simply would not risk riding with them down a road with only a strip of paint to protect them. Subjectively, it’s unsafe with HGVs and cars passing close by. Objectively, there is a strong likelihood of having to move into the road owing to the actions of selfish drivers. It’s just not suitable for cycling, unless you’re already a confident cyclist. Vans. Sharing the pavements and bike lanes. And secondly, yes, on occasion this might be to the detriment of other road users. The current road system is almost entirely car centric. The mini Holland scheme is to redress the balance. It’s job is to ensure that the motor traffic hegemony is broken and the roads are fit for a thriving community, not a car-clogged community. Pedestrians and cyclists have simply not been given a fair deal in the past. This scheme addresses that. It is therefore obvious that sometimes motor traffic will have to concede some of the roadspace over which it presently holds unfair dominance. The image above is Kingston’s one-way system on a quiet day. It’s quite clear that motor traffic has received the bulk of road infrastructure investment over the years. The result has been a choking of our town with noisy, polluting traffic. It’s time to redress this balance, and properly fund more sustainable infrastructure. Finally, here’s a quote from Boris Johnson, when the funding was announced. If Kingston Council is unwilling to implement this, perhaps they should stop wasting everybody’s time and just hand the money back to somebody who will do the job properly.